The Detective+ transportable area monitor is based on the highly successful Triple Plus+ and Detective models, building on the reputation, reliability and versatility of its forebears. Detective+ is inherently rugged and robust, with a sturdy fixed or folding leg protective frame option. Loud and clear alarms can be transmitted between Detective+ units while an optional built in pump allows faster gas response and better sensor protection. Detective+ may now be equipped with infra-red sensor technology, which provides either CO2 detection, or allows higher flammable gas level monitoring and immunity to the poisoning effects which standard flammable gas sensors can suffer from. There are now two options for battery capacity, either 36 hours or 60 hours with standard configuration, providing remote sites with extended usage in-between charges. Couple these features with the wide range of toxic gas sensors available and it makes Detective+ one of the most versatile area monitors available. 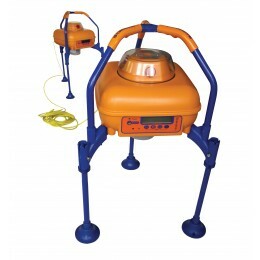 Up to 4 gases monitored in a rugged and sturdy protective frame. Ultra-loud 104 dBA sounder and red LED cluster alarms. Wide range of sensor options including infra-red. Long 36 or 60 hour battery life. Raised detectors, coupled with IP65 specification provides excellent sensor protection. Built-in pump option to provide faster gas response. 12 Detective+ units may be linked together, up to 100m from adjacent units.